Bobby Jindal runs for president: Louisiana governor allowed creationism in science class. 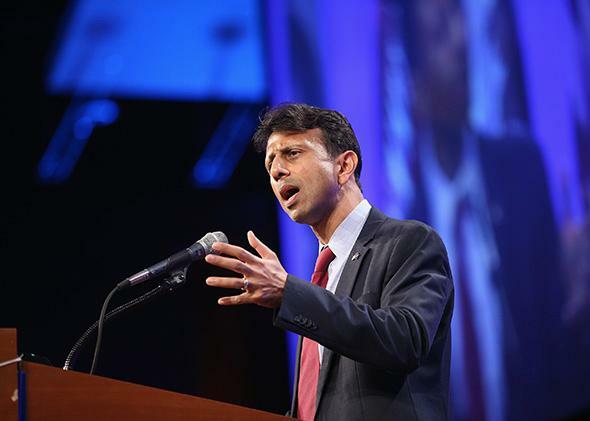 Louisiana students are suffering for Bobby Jindal’s presidential ambitions. Creationist in public, biologist at home? Above, Louisiana Gov. Bobby Jindal speaks at the Republican Party of Iowa’s Lincoln Dinner on May 16, 2015, in Des Moines. The chairman of that committee, state Rep. Don Trahan, had his own one-liner. “There’s a difference?” he asked. Our governor, Bobby Jindal, acts as if there is no difference. And that is a big part of his strategy for pursuing the presidency—and as he announced on Monday, he has formed a presidential exploratory committee. His ambition for even higher office has led him to pretend that along with politicians, science teachers should be preachers, too. A few minutes after Husser’s joke, the bill that he had been supporting—the badly misnamed Louisiana Science Education Act—was passed out of committee, and Jindal later signed it. It was the summer before my sophomore year at Baton Rouge High School. I couldn’t believe it. For most of my life, my family has known Bobby Jindal. He and my father had worked together under Gov. Mike Foster, and my parents had been friends with Jindal and his wife, Supriya. The Jindals still send my family a Christmas card every year. When Jindal first ran for governor in 2003, when I was a fifth-grader, I talked up his campaign to my classmates at the University Lab School, the same school that Jindal’s own children now attend. Earlier in that 2008 summer, the creationism bill had come up at our dinner table, and my family was sure that the governor would veto it. We knew him. He wasn’t a creationist, he was a Brown University biology major. But Jindal wanted to run for president, so he became a creationist. I can’t forgive Jindal for signing the creationism law—once, in high school, I was on the same plane flight as Jindal, and my father warned me, “If the governor says ‘hi,’ do not be rude to him”—but the law was not his brainchild. Its language was written by the Discovery Institute, a creationist think tank, which drafted a “Model Academic Freedom Act” that became the Louisiana Science Education Act. This older “balanced treatment” legislation (predating the Louisiana Science Education Act) mandated that creationism be taught wherever evolution was taught, and it was passed in a number of states, including Louisiana. The Louisiana law, the Balanced Treatment for Evolution-Science and Creation-Science Act, was thrown out by the Supreme Court in the Edwards v. Aguillard ruling in 1987, which invalidated the teaching of creationism in public schools. Forrest noted that the “Supreme Court explicitly rejected the Louisiana law’s academic freedom rationale” in the Edwards ruling. But what are Jindal’s own children actually learning? Bates told me that “the governor hopes his children are exposed to all kinds of different science and theories.” Whatever the governor may hope, his kids are attending one of the best schools in Louisiana, and they are only being taught evolution. I know, because I had their seventh-grade biology teacher, Catherine Cummins, myself, and she makes a point to emphasize real science. Many other students in Louisiana aren’t so lucky. A national poll showed that 13 percent of American public school science teachers teach creationism outright and an additional 60 percent defy the National Research Council’s recommendation to endorse evolution over creationism. In Louisiana, where the Science Education Act protects teachers who break the law, it can be even harder for many students to learn evolution. Maybe Jindal does parent the way he practices politics when it comes to his own kids. Last fall, when Stephen Colbert criticized Jindal’s creationist “retreat from knowledge,” Jindal shot back. He tweeted, “missed [your] show last night, was too busy pulling out pages on evolution in my kids’ biology textbooks.” I know Jindal was trying to make a joke, but for years I’ve watched his creationist policies deny students across Louisiana a science education, so it felt like it could be true. I’m sure Jindal’s kids are intelligent, capable, and hardworking. And they’re learning evolution. In fact, in the governor, they probably have an excellent science tutor. They might even go to Brown University and major in biology, just like their father. I just hope that unlike their dad, they never embrace pseudoscience because of their presidential ambition.